I had the opportunity to meet with Joachim NG, who works for iDA, a government agency responsible for the growth of the Singapore ICT industry. Joachim, who was very welcoming to me, is responsible for all business relations to companies, primarily tech in the United States, his title Country Director, US Office, where he’s station in Redwood Shores near Oracle. Think of him as a business ambassador from Singapore to the corporations (and startups) of US. I was surprised to find out that Milpitas based Creative Labs is actually a Singaporean company, cool! My interest in Singapore started during a trip this summer, I found the small country to have a strong business focus, and growth in the social media space, I’ve kept in touch with many folks in Facebook, blogs, and even hosted friends. 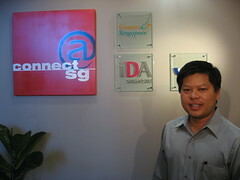 In fact, I’m having dinner with TDM‘s Steve Ming Yeow tonight at the Social Media Club at Yahoo. Singapore’s IDA assembles thought and practices leaders from CEOs of major tech companies to visit the country as well as practice leaders in the trenches, I expressed a desire to continue to try to connect cultures that embrace the web –both Silicon Valley and Singapore can leverage each other. I’ve invited Joachim, my new friend out to upcoming Lunch 2.0s, Social Media Club events and suggested a few other conferences and events to meet our community, I’m sure we’ll be seeing more of him. So let’s hear from the Silicon Valley web community (or outside) what are you doing to plan to expand to Asia? Are you offering your site in multiple languages? Is your UI ready for Asian preferences of design? I find this global internet usage data to be helpful, guess which region has the most internet users?